Rexently, the Weber grill company released the Genesis II and II LX series, updating their popular Genesis line with a brand new line of products—the most significant update to Weber’s product line in the last ten years. The new lineup is objectively impressive, decisively differentiating Weber from its competition in terms of quality and versatility. There are dozens of significant differences between the Genesis II / II LX grill models and their predecessors, but here we’ll focus on the most dramatic and significant improvements. New for 2017, Weber has split the Genesis lineup into 2 different series, the Genesis II for casual grillers and the Genesis II LX for grilling perfectionists. With the Weber Genesis II series, Weber streamlined the iconic Genesis design which some believe has been long overdue for a significant makeover. Genesis series grills now come equipped with either an open-structure design or cabinet design based on the needs of each individual griller. Grill shrouds are now slightly shorter, giving each grill a wider body profile and a more luxurious look. We’re quick to note that the open cabinet design is a radical design choice for the Weber company, who appear to be exploring the “full-monty” design as a result of users desire to have visually apparent protection for the the grease tray and other areas from accumulating waste, stray leaves or wildlife if the cabinets are left unattended. Additionally, replacement of the LP tank is now far easier than ever before in the new Genesis II series, marking a significant improvement to convenience and ease of use over previous models. Some of these features come with marked improvements to longevity, performance and overall ease of use over previous Genesis series models. The burners are the heart of any grill, and Weber has made major improvements to their burner designs in the Genesis II series. These new burners provide even heat throughout the cooking surface, making every inch of the grate an effective, predictable and dependable cooking surface. Uniquely tapered burner tubes provide consistent pressure, including alignment from front to back, which provides a more consistent flame and even heat profile. Burner holes (also known as “ports”) have been made larger and more extruded. 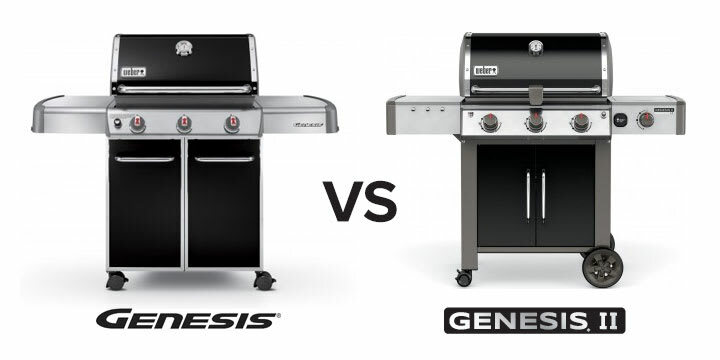 As a result, the new Genesis II burners are more resistant to corrosion and clogging issues that can sometimes plague other grill models and series. You can likely see the difference between these two sets of images—the old burners became more easily clogged, as well as suffering from uneven temperatures from the front of the grill to the back. The most common issue was a hotter front of the grill than the back as a result of the gas pressure not reaching the back of the grill. The new Genesis II burners solve both issues with a tapered design and larger, protruded openings to address these concerns with aplomb. The new E2i electronic ignition system is more durable and more reliable compared to previous incarnations. We believe that the E2i system is the most superior ignition system Weber has ever created. Below is an up-close picture taken after we dismantled one of the Weber II grills to its most basic components. You’ll notice a single push-button igniter on the Genesis II series, with an igniter on each individual knob (featuring easy-press design) on the Genesis II LX series. The LX series also boasts an ambient light and high-heat option on each unique knob, a luxurious set of features that also serves to set the LX series apart. Weber has also lovingly revived the 2-burner edition of the Genesis II and II LX, and thank heavens for that inspired decisions—this provides grillers a choice other than opting reluctantly for the inferior Spirit series for grilling in smaller spaces or balconies. On the other side of the size spectrum, the new Genesis series features grills with four and six burners for those who like to do some serious grilling. At Designer Appliances, we have been working closely with Weber for years to offer our customers the absolute best grill lineups while also providing unparalleled customer support. This year, Weber has returned the favor by releasing their Genesis II SE Series grill only available to a few of their select Weber dealers, including Designer Appliances. You won’t find this model at your big box home improvement stores. Weber is known to have the best warranty in the industry for its grilling products. Genesis II and II LX series are not an exception to this. Weber provides and amazing 10 year warranty for the heart of their grills (i.e. Burners, Ignition, Lid and the Cookbox). Furthermore, the porcelain enamel grates and flavorizer bars of the II series are warrantied for 5 years. On stainless steel versions of grates and flavorizer bars on II SE and II LX series you will get the 10 year warranty. We are very excited to begin the 2019 grilling season and finally get these incredible grills into the hands of our customers. For more information or to purchase a Weber Genesis grill (now with free shipping anywhere in the U.S.), visit us at Designer Appliances.